In a busy work environment, face-to-face meetings aren’t always possible or the best use of colleagues and employees time. With a conference phone set up, many meetings can be conducted as audio conferences instead, providing a time-saving and cost-effective alternative to traditional meetings. So what is the best conference phone? Our team of experts have compiled a list of ten of the most popular and highly-regarded conference phones available. The top of the pack are Avaya B100 Series, Polycom RealPresence Trio, Grandstream GAC2500, Yealink CP960 and Polycom SoundStation 2. To save you a bit of time, this table gives a quick overview of the top 5 conference phones on the market. You can find more complete reviews of all 10 of the phones that have earned a spot on our best conferences phones list, further down the article. Deciding on which conference phone is best for your office is no easy feat. Between countless features and dozens of unique price points, a little information goes a long way in making the right call. So here we’ve collected all the research you need to choose the setup that’ll make your business as productive as possible. Now that you’ve got a general idea idea of what these conference phones offer, take a deep look at each specific device to make sure you’re making the right decision Finding the right conference phone for your business will depend on a number of factors. These include the budget you have at hand, the size of your conference rooms and number of models needed. This section gives a comprehensive breakdown of the best VoIP conference phones available, taking into consideration price as well as the reach of each model, meaning you can find the perfect conference phone however large or small your office and meeting rooms are. Use the links below to jump to a specific conference phone model’s review, or scroll down for all ten. The Avaya B100 series of conference phones incorporate many features that make it easy to set up and administer conference calls via web-based applications or a corporate directory. The Avaya B189 is an executive conference phone with touchscreen display and HD quality audio. 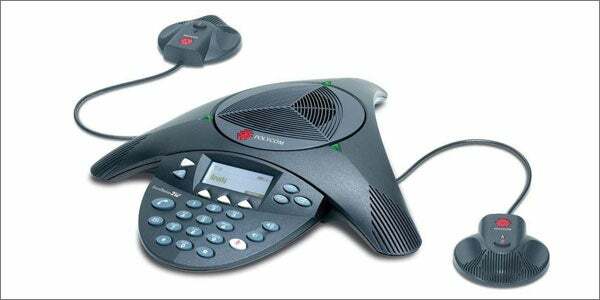 Avaya B179 is a SIP-based conference phone for large meetings and features Avaya’s patented wideband audio technology. The Avaya B159 and B149 offer useful features for recording calls, setting up multi-party calls and saving call groups. The Avaya B100 series offers a choice of VoIP conference phones for different size meeting rooms or executive suites. High-quality audio and practical conferencing guides feature across the range. 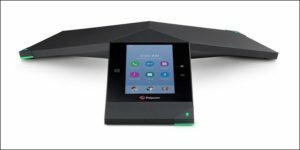 The Polycom RealPresence conference phone is by far the most stylish piece of technology in this comparison list and the feature rich system will also exceed expectations with its high quality audio as well. With a 20 foot pick up range the RealPresence Trio is suitable for even the largest of boardrooms and can aid collaboration between whole teams easily. 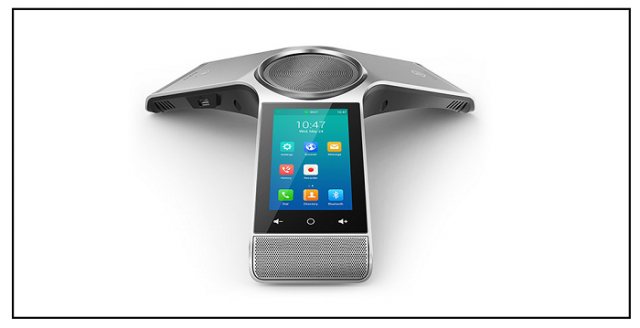 The Polycom RealPresence Trio offers exceptional voice quality and it’s slick design means it will look at home in any modern meeting room. The price is slightly higher than other VoIP conference phones on this list but the features more than make up for it. The Grandstream GAC2500 is a modern VoIP conference phone featuring up to 6 SIP lines. The stylish speakerphone will not look out of place in the most modern of office spaces while the 4 inch touch screen makes it incredibly easy to dial out and take calls. 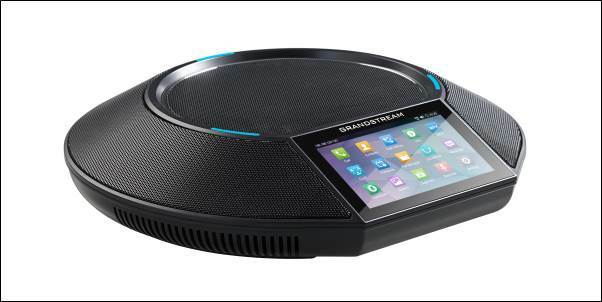 The latest model from Grandstream, the GAC2500 offers HD voice quality making it ideal for conference calls which incorporate a number of team members or different departments collaborating on a single project. An advanced VoIP conference phone at an affordable price for small conference rooms and executive offices with up to six participants. 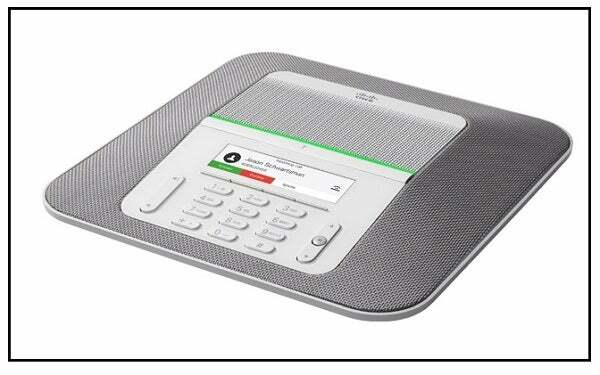 The Yealink CP960 IP conference phone is designed for small and medium-sized conference rooms. It can support a radius of 20 feet for speakers in the room, and with the addition of optional wireless microphones, this can be extended to 60 feet. The unit provides optima HD technology, a built-in 3 microphone array, full-duplex technology and acoustic echo cancelling to enable clear, life-like conference calls. It also supports call recording and linkages to mobile phones or PCs. The Yealink CP960 IP is a useful conference phone for meetings in small or medium conference rooms. Call recording and linkage to mobiles adds to its versatility. 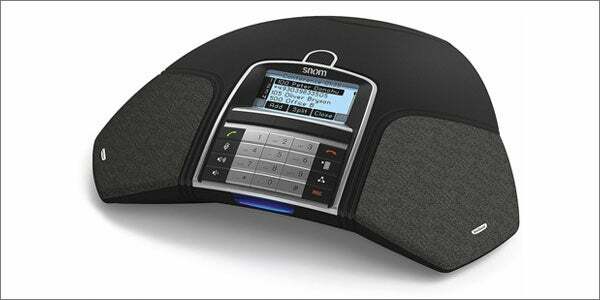 The Cisco Unified IP Conference Station 8832 is a modern conferencing phone with a full color backlit display. It can support large meetings and caters for up to 26 attendees with a microphone that can cover a wide area. Its design means that it is highly portable and can be easily taken from one room to another. An excellent choice for medium to large businesses, the Cisco 8832 IP Conference Phone is easy to use and is also scalable. Works with any SIP-based IP PBX. 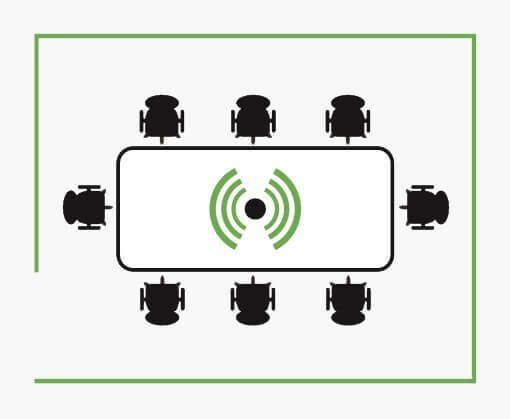 The Snom Meeting Point incorporates useful features and good sound quality for mid to large conference rooms. The Polycom SoundStation2 delivers full duplex audio to suit small to medium meeting rooms. New features include easy-to-read LCD display and a 50% increase in microphone sensitivity over the previous Soundstation model. Participants can be heard from up to ten feet away. The unit connects to a standard analogue line or analogue extension from a PABX. This is an ideal solution for small to medium sized meeting rooms with good sound coverage and simple operation. 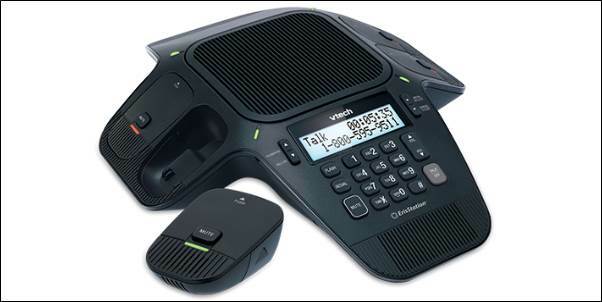 The VTech VCS704 is an analog conference complete with PBX & PSTN compatibility that can be used with up to 2 lines. The VCS705 ErisStation is a wireless conference phone that includes an accompanying magnetic charging bay within the phones base to ensure each microphone is fully charged and ready for meetings at any time. The modern design also mean the model will not look out out of place in any office, while still offering a crystal clear voice quality at all times. A versatile conferencing system for larger meeting rooms using acoustic beam forming technology to achieve clear natural sound from all participants. 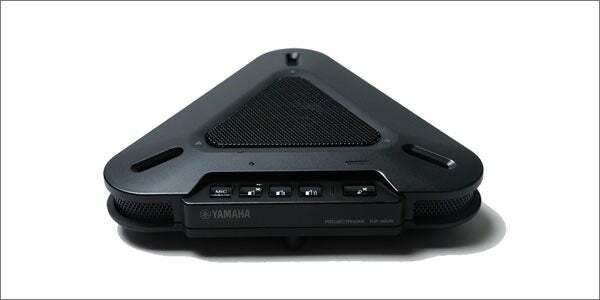 The Yamaha PJP-20UR is a versatile conferencing unit for small meetings or participants on the move. 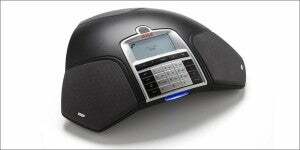 The Polycom SoundStation IP 7000 conference phone is designed for midsize conference rooms. It delivers high fidelity audio from 160 HZ to 22 kHz, designed to best capture the high and low frequency of the human voice, meaning that your colleagues will sound as though they’re in the room with you. Built-in security features mean that calls are protected. 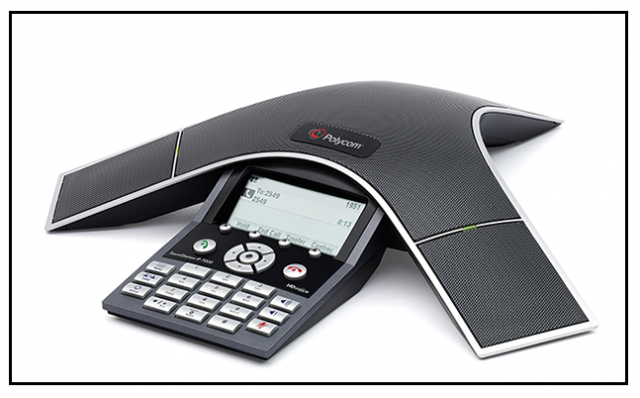 A premium VoIP conference phone designed for midsize rooms with excellent sound reproduction. A hundred conference calls lasting an hour each with four of your staff will cost more than $10k (if they make $60k/year). The cost of good VoIP conference phones is minor compared to the salary costs of time spent in meetings. Traditional speakerphones are basically desktop telephones with an incorporated speaker. They usually have no echo cancellation and only one microphone. They are designed for a single user sitting directly in front of the phone who sometimes uses it for hands-free calls. Speakerphones are not built for group discussions, and if several people sit around a speakerphone, the sound quality from the conference phone speakers is often very poor. A conference phone is a single unit designed to operate in an open-air environment. It is a standalone device but can be supported by extension microphones. They are as easy to use as regular phones and are built to cover an entire room and all the people in it. Conference phones incorporate echo cancellation and noise reduction together with other advanced signal processing technologies for reproducing clear sound. Wireless conference phones are easier to move around but must be recharged. The market has developed enormously in the last 15 years and there are many models which are suited to different needs. 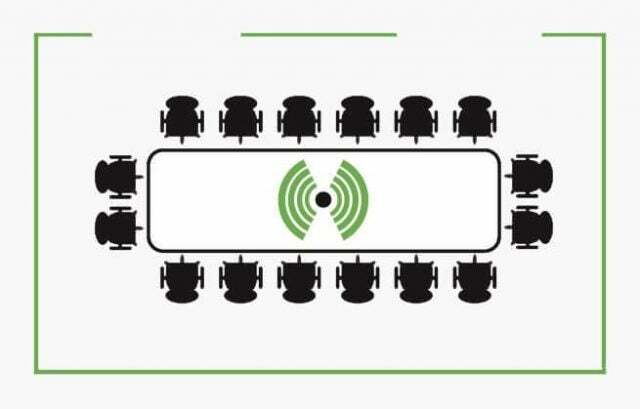 An installed conference system is built in to the room. There are a number of microphones and speakers throughout the room and some of them can be moved to accommodate different situations. Each component is controlled by a very sophisticated system that adjusts speaker outputs, the microphone gain levels, as well as the other variables required to maximize audio quality. The installed system’s advanced signal processing can eliminate problems that often occur in a larger room. For example, loudspeaker zones, feedback, multiple echo, and other difficult noise problems experienced by conference phone speakers. These systems are often integrated with video conferencing equipment and the installation is usually done by a system integrator or A/V consultant. Sound Quality – It’s of primary importance that your meetings can be conducted efficiently and without confusion caused by poor sound quality. All the models we have selected on this page are from manufacturers renowned for quality design and the integrity of their sound reproduction for conference phone speakers, and for each one satellite speakers can be connected as necessary to extend the listening range for larger meeting rooms. Minimize wasted time and travel costs – With phone conferences you can quickly gather colleagues together for the meeting regardless of where they are geographically. Your colleagues working remotely can use a video conferencing app, computer or regular phone to dial in and join the discussion, then those in the office can all jump straight back into other tasks directly afterwards. No more unnecessary travel costs, missed flights or traffic jams to contend with! Be spontaneous and agile – With audio conferencing you can quickly pull people together for ad hoc meetings with minimal prior scheduling. Respond and collaborate efficiently as business developments unfold. Fast ROI – You’ll find that a conference phone for your business will very quickly pay for itself when factoring in those resulting reduced travel costs and minimized wasted time. Microphone: The quality and pickup range of the microphones is particularly important. Directional microphones will discard noise and echo coming from behind them while cheaper omnidirectional microphones will pick up noise from every direction. Noise reduction: Advanced signal processing for suppressing pickup of unwanted sounds is crucial. 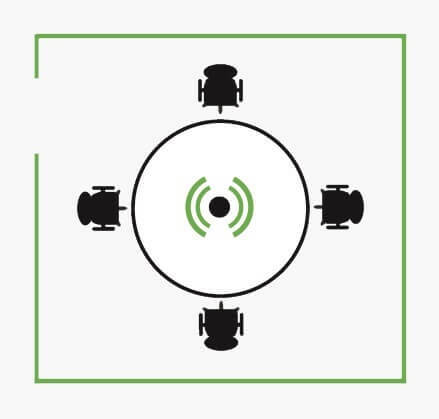 Full duplex sound: Full-duplex is another important feature. It will enable the participants to speak at the same time without cutting off one another. This ensures that the conversation can flow naturally without interruptions. Almost all modern conference phones now come with wireless and VoIP capabilities as standard. There are many reasons to make the switch to an IP phone system, if you still use traditional lines, including the cost savings available and the crystal clear sound quality that can be achieved via your internet connection. Wireless speakerphones also offer advantages to businesses both large and small, offering a modern look for any conference room.